Chester Regatta was established in 1733, more than 280 years ago, although rowing races were certainly held in Chester before this. Chester Regatta is the oldest rowing regatta of its type in the world, with 100 years more history than the Oxford / Cambridge Universities Boat Race (1829) and Henley Royal Regatta (1839). Records show rowing in Chester for more than a millennium. In 973AD King Edgar visited Chester following his coronation in Bath and was rowed on the River Dee by the “eight kings of Britain”. Another account says in 1541 the scholars of King’s School Chester rowed Henry VIII on the Dee. In Joseph Hemmingway’s History of the City of Chester, written in 1831, there is specific reference to Chester Regatta. “1814, June 17, the City illuminated in the commemoration of the General peace … a regatta took place on the Dee.” He also described the regatta of 1817; “… when Liverpool and other aquatic minded cities sent boat crews to compete in the races … the surface of the Dee was covered with boats decorated in all the gaudy splendour of various covered floats.”. In 1814 there were three events – an open race for a prize of four guineas, an event for young women for a purse of two guineas and another for boys of a purse of two pounds. The crews started opposite the Snuff Mills, raced upstream to the bottom of the Groves and back again, twice. Contemporary reports say the 1814 Chester Regatta was preceded by “an ordinary at Mrs Jones’s at the Bear and Billet; Dinner on the table at one o’clock”. The Bear and Billet is still a pub not far into town from the old Dee Bridge. A poster for Chester Regatta in 1832 displays events for six-oared and four-oared gigs for amateurs and professional boatmen, as well as an event for women in fishermen’s boats. A poster for the 1840 Chester Regatta, reproduced HERE, lists twelve events including a coracle race and the Dee Cup race. Two Chester struck silver medals from the 1831 Regatta were recently loaned to the Regatta by Dr Andrew Campbell. The face of one states “Won by The Zephyr at the Chester Regatta on his Majesty’s birthday 1831” and the reverse shows the initials CLRC – probably Chester Ladies Rowing Club. 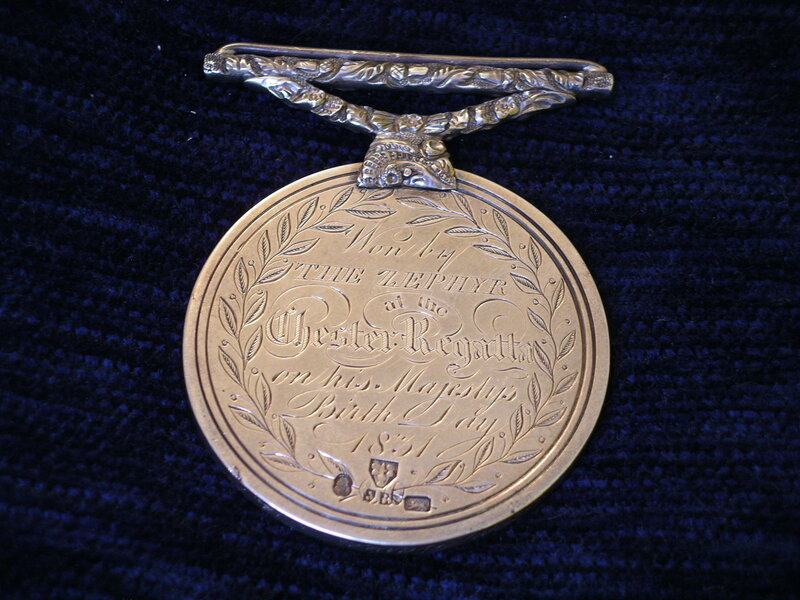 The face of the second medal shows a six-oared gig and its back states the date 22nd August 1831. To celebrate the coronation of Queen Victoria in 1838, Chester Regatta consisted of “seven races open to competitors from all parts”. The most important was for the Coronation Cup for four-oared gigs. Queen Victoria married Prince Albert of Saxe-Coburg in 1840 and to celebrate the occasion the Rt Hon Lord Robert Grosvenor, MP, donated the Prince Albert Cup to the Regatta“in honour of her Majesty’s nuptials, to be rowed for on the waters of the Dee”. In May 2008, a silver trophy awarded at Chester Regatta in 1895 for the Maidens event was donated to the Chester Regatta Committee by Graham Oakley, Group Secretary of Marks & Spencers. The trophy had come into his hands from the estate of a distant relative. He recalls being told that many years ago it had been found in a garden, possibly discarded after a burglary as being too distinctive to be readily sold. The trophy was gratefully accepted by the Committee and will be on display at this year's Regatta with the other magnificent silverware. 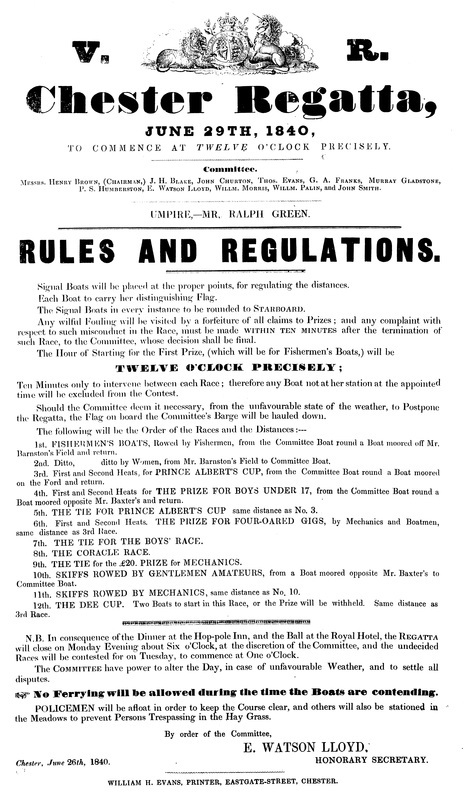 Also on display will be various previous Regatta Programmes, some well over 100 years' old, including that for 1895 in which the Maidens event (above) was described as, “the Ladies’ Prize, value Fifteen Pounds”. The Regatta Programmes show how the Regatta has been run over different courses over the years. Today, most racing commences just above the Et Alia (Red House) restaurant and bar, in keeping with the public house tradition of 1733 and finish at Sandy Lane Park, a 750m sprint course. However, in the morning of Regatta day the adult Time Trial course starts at Heronbridge and is 1800m. In 2015 British Rowing asked its membership to suggest new innovative competition formats and some Heads and Regattas put these "Pathfinder" formats into practice. ​The format at Chester Regatta 2016 was broadly the same as Chester Regatta 2015. We ran J13/J14/J15 events as a traditional regatta (usual J15 & under events). As in 2015, the 2016 Chester Regatta started with a Time Trial over 1800m for all boats. Crews could be made up of competitors of any status, age, gender, race, religion or nationality - as long as they held British Rowing race membership. Who was in the boat was up to the entering crew but they had to specify names and BR membership numbers when entering, as usual. What was different in 2016 from 2015 was that after the Time Trial the boats were split into seeded Events (ranked solely by reference to speed in the Time Trial) raced over 750m. All crews (excluding J13/J14/J15) were guaranteed at least two races (Time Trial over 1800m and a race over 750m) and the chance of at least one other race (the final) over 750m. Normal British Rowing rules applied to changes of crew between the Time Trial and the seeded Events. Winners of each Event received engraved Chester Regatta QUART Tankards. Trophies were awarded to the fastest Eight, Four and Quad in the Time Trial; the crews of the fastest boats of all sizes and compositions (including Open, Women, Mixed) in the Time Trial received medals, unless there were only one in that size and composition. 2016 Chester Regatta poster is HERE.